Rock. Paper. Scissors. Let’s play a simple game that can teach us how to balance the three Ayurvedic doshas (Vata, Pitta, Kapha). But first, what is Ayurveda? And what are the doshas? Ayurveda is science of Life (Ayur = Life, Veda = Science). It is the sister science of Yoga, and it teaches us how to manage our health at every level – physical, emotional, mental, and spiritual. According to Ayurveda, the doshas are three primary qualities that we each embody in different amounts, and each dosha is derived from a particular combination of the five elements: earth, water, fire, air and ether (space). Dosha means “imbalance,” and each of us has a tendency to move out of balance in a particular direction. When you get off balance, do you tend to get “fiery” (Pitta)? Do you get “spacey” (Vata)? Or do you get “heavy” (Kapha)? Or perhaps a combination? When we can recognize our doshic tendency, we can use the rock, paper, scissors game to find our way back to balance. When you feel out of balance, notice which qualities you embody most. Then, play the rock, paper, scissors game to move you in the direction that will best support your well-being. Have you ever experienced those lazy times when you would rather stay on the couch wrapped up in a blanket? That heavy blanket might give you comfort, but it can also keep you trapped! When you feel stuck, listless, heavy, frozen and unable to move – you have excess Kapha. You’ve got the qualities of rock. According to Ayurveda, like attracts like, so if you’re feeling heavy and stuck, you’ll probably want to stay buried under the blankets and won’t have much motivation to move. But you must generate the heat to move! What can you do? Break up the Kapha stagnation by moving toward the qualities of Pitta. Go find your scissors! Sharpen your focus, and cut through the dullness. You won’t win with paper’s Vata qualities. Vata’s cold and airy nature will feel uncomfortably expansive, speedy and ungrounded for you. Victory! You win when you take action. Pitta’s sharpness can bring the right amount of intensity to get you moving in a positive direction. Suggestion: Sharpen your focus and challenge yourself to get unstuck! Get moving. 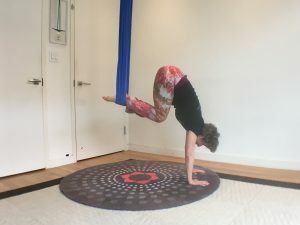 You don’t have to enjoy the movement – your kapha imbalance will probably resist it! But move anyway – vigorously. Movement can focus your breath and generate heat, and you must generate heat to unfreeze your mind and body. As you melt your resistance, Pitta’s energy can help shed light on the mind’s habitual thought patterns, and help you shift into greater clarity and action. 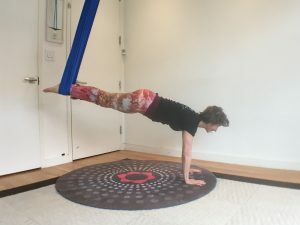 Unnata Aerial Yoga positions to try for excessive Kapha: Core strengtheners such as Plank, Crow, or many of the standing poses can all generate the Pitta heat you need. When you feel flighty, unsettled, anxious, restless, worried, you have excess Vata. You’ve got the qualities of Paper – weightless and airy. You may enjoy your speedy movements now, but gone unchecked, you could get lost in the clouds like a paper airplane! What can you do? Ground your Vata energy by moving toward Kapha. Wrap yourself around a stable Kapha rock to slow you down to a normal speed. You won’t win with Pitta’s razor sharp cutting qualities. Pitta’s intensity and focus will feel like it dissects and limits your expansive creativity. Victory! You win when you get settled on a rock! Kapha’s stability will help you ground your ideas into solid reality. Suggestion: Get grounded. Kapha’s blanket is your friend, so get cozy. Practice slow, steady, mindful movements to channel your high-speed energy into something tangible. It may seem at first like you’re bogging yourself down, but the extra care you put into your efforts will not only slow you down, it will give your efforts more meaning. 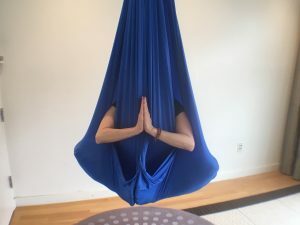 Unnata Aerial Yoga positions to try for excessive Vata: Positions completely inside the hammock such as Head-to-Knee pose, Cobbler’s pose, or even Corpse pose inspire a kapha-like hibernation that can calm you down. When you feel angry, aggressive or unforgiving, you have excess Pitta. 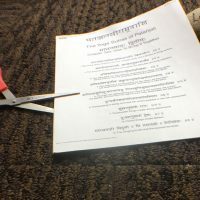 You’ve got the qualities of scissors – sharp and cutting. That anger might fuel your motivation, but your intensity and laser focus could cut you off from others and prevent you from seeing the bigger picture. What can you do? 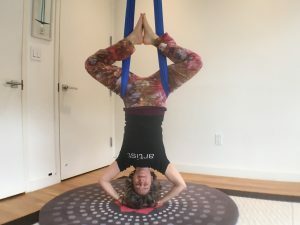 Invite Vata to give you a higher perspective. Kapha’s sluggishness kills your determination. Kapha is too heavy and slow for you now. Victory! You win when you create more space. With Vata’s paper-like lightness and mobility, anything is possible. You can expand your creative perspective, inspire new ideas, and soar. Suggestion: You might have a very good reason for being angry. But anger is often fueled by an incomplete picture of the situation. Are you looking through the lens of your unconscious biases, or even misinformation? Go ahead and feel your anger, but don’t obsess about it! When anger gets too hot or focused, it can burn a hole right through you. Go for a walk in the cool air. Take several deep breaths to put some time and space between the incident and your angry reaction. Do a little research and dig up more information to expand your perspective. Give your heart and mind some breathing room before you act on your anger. 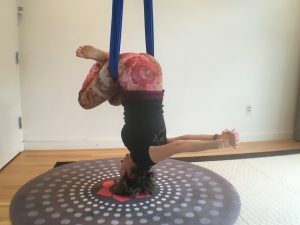 Unnata Aerial Yoga positions to try for excessive Pitta: Hanging positions held for short periods of time, especially inversions such as Back Straddle and Hip Hang, will bring Vata spaciousness into your being. But don’t hold those positions for too long or the blood will rush to your head and you’ll get “hot-headed” again! If you’re experiencing too much of a particular doshic energy, you can use this fun game to remember which actions will bring you back into balance. Rock wins with Scissors. Kapha moves toward Pitta. Paper wins with Rock. Vata moves toward Kapha. 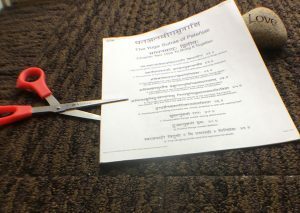 Scissors win with Paper. Pitta moves toward Vata. Move in the direction of your winning energy! Samara Taylor is a yoga teacher and writer who lives in Colorado. 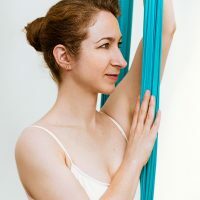 She studied Unnata Aerial Yoga with Michelle Dortignac in 2014 and currently studies ParaYoga with Rod Stryker. 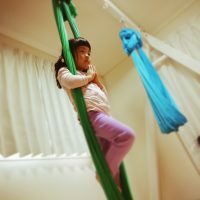 Samara enjoys sequencing yoga classes according to Ayurvedic principles.